Long Before There Was 'Fake News,' There Were 'Fake Photos' : Goats and Soda The pictures of 19th-century Egypt and other scenes, in an exhibit at the Clark Art Institute, don't always show the truth. Orientalist Study, 1858. The two men are in fact white Europeans, posing in a London studio. 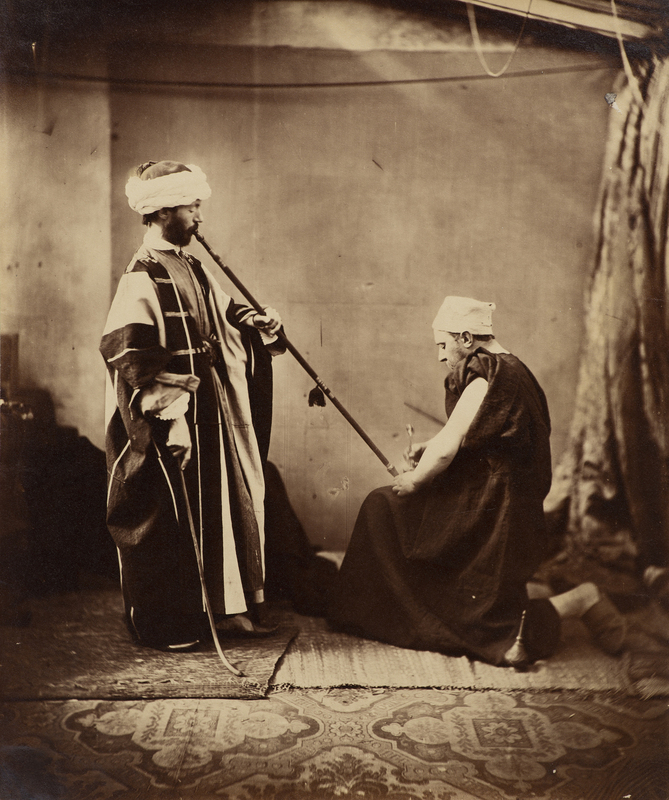 On display at the "Photography and Discovery" exhibit at the Clark Art Institute in Williamstown, Mass., is a photo of two men dressed in traditional Arab garb in a carpeted room (above). They're smoking a pipe. It's a beautiful photo, but it's not from the Middle East. It was shot in a studio in London by photographer Roger Fenton. The men in the photo are white Europeans, dressed up and posing as Arabs. The whole thing is staged — as are several of the exhibit's images. The photos were taken in the 19th and early 20th centuries, roughly the first 75 years of photography. This was also a time of rising European colonial power. European empires needed justification for subjugating vast swaths of earth, and photography could frame the Arab and Asian world in a way that supported the empire, says Ali Behdad, a professor of literature at UCLA and author of Camera Orientalis: Reflections on Photography of the Middle East. The Pyramids of El-Geezeh from the South West, from Egypt, Sinai and Jerusalem: A Series of Twenty Photographic Views, c. 1860. 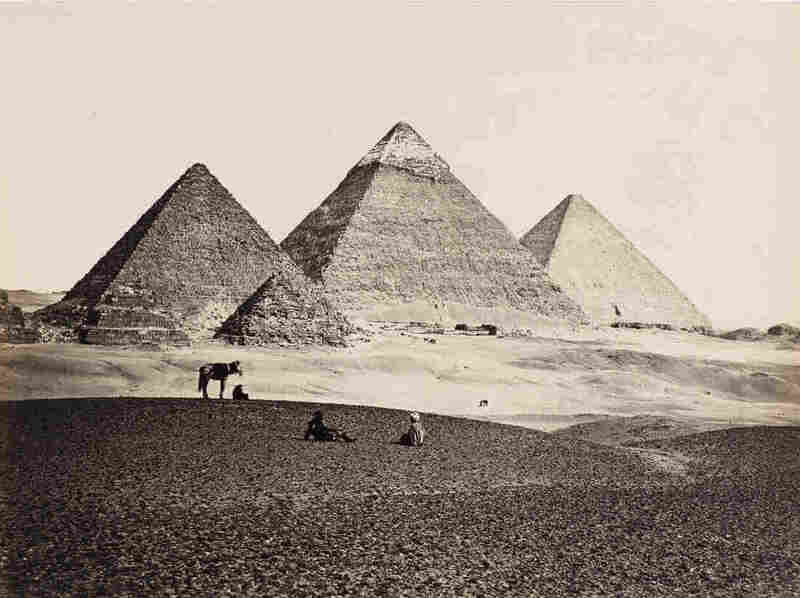 Take the photo of the pyramids at Giza, shot by prominent 19th-century photographer Francis Frith. The pyramids are in the background, and the surrounding sands are desolate save for two picnickers and a pack animal. The terrain is majestic and the pyramids tall and timeless, if crumbling slightly. Like the photo of the pipe smokers, this photo was staged. The picnickers are members of Frith's photography crew, as the museum label notes. And the people of Giza — the third largest city in Egypt – are nowhere to be seen. "It's to make it seem this place is a historical ruin that needs to be fixed up by Europeans or appropriated by them," Behdad says. The British occupied Egypt 20 years after the photo was taken. Because of the camera's eyewitness quality, people believed that what they saw was true, says Luke Gartlan, a professor of art history at the University of St. Andrews. The museum takes care to explain the story behind the images, says Jay Clarke, the exhibit curator. Labels beside the exhibited photographs identify when white men engaged in brown face, and the photos of crowded France beside a barren Burma add to the idea that some countries were barely populated. "The exhibition certainly does present a Eurocentric view," Clarke says. "We only recently began to collect works by non-Western artists." The idea of using photos to make a political statement, meanwhile, continues to this day. In the Middle East, Behdad says, news and contemporary photography often depicts Arabs as "terrorists, people who oppress their women. That perpetuates the kinds of policies of exclusion that we see in Europe, Holland, France and the United States now. It's about image. It's about perception." How Does One Create A 'Fake News Masterpiece' And What Happens Next? But in recent years, there has been more and more photographic and video documentation from people in developing countries. Video blogs from locals in besieged Aleppo flew across the world through news coverage and social media, for example. "Our history has always been written by people other than us, specifically in photo," says Sima Diab, a Syrian-born photojournalist based in Cairo. "In the last six to 10 years, however tough it's been, [news and life in the Middle East] has been documented extensively by locals." 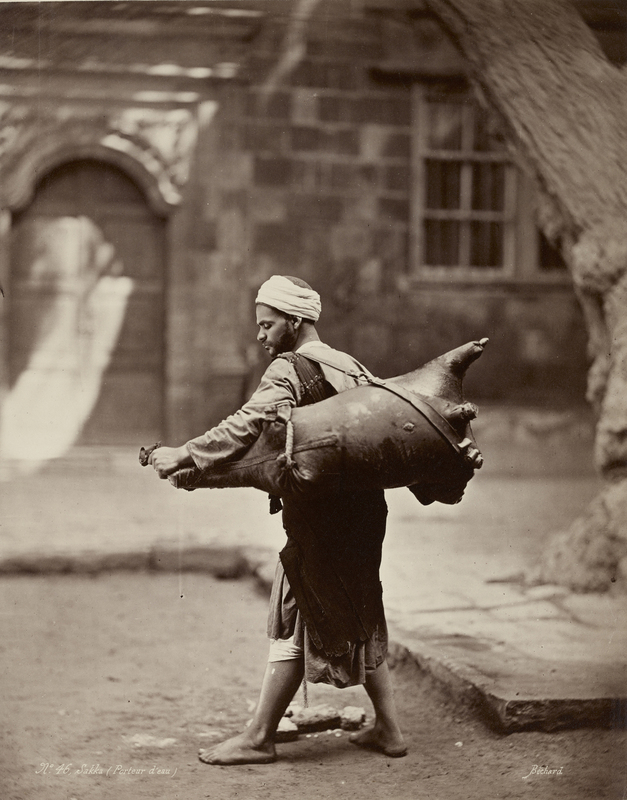 Water Carrier, Cairo, c. 1875. That's a far cry from the days when two white Europeans could pose as Arabs in a London studio. But whether this new wave of photos will have the same influence as the images of the past is still an open question.